In the early 1900s, two artists, Mary Page and Beatrice Carter, were employed by the Bolus Herbarium to illustrate a hugely diverse family of succulent plants, which are almost endemic to Southern Africa. Their delicate, precise and vividly coloured botanical drawings are now freely accessible online. 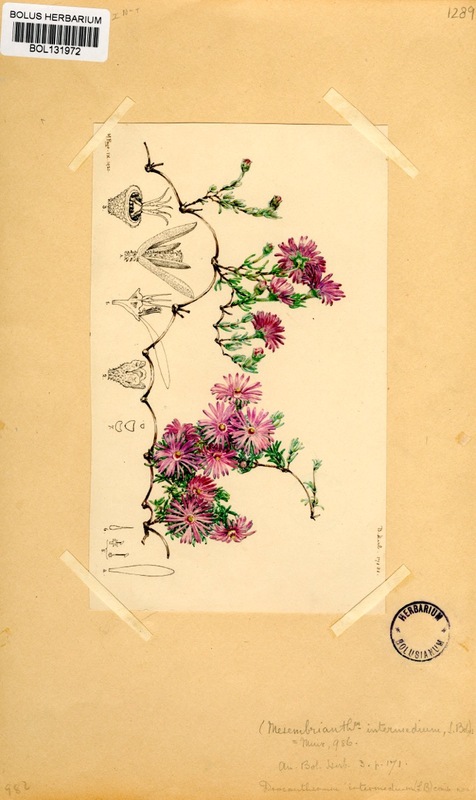 View the Bolus Herbarium illustrations on the Digital Collections website. 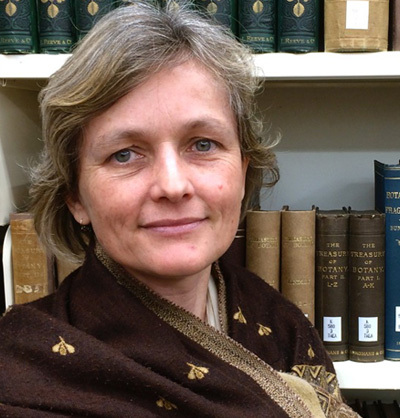 Cornelia Klak is the specialist curator of the collection of Aizoaceae at the Bolus Herbarium, where she has worked for the last 16 years. She has done extensive research into the systematics, taxonomy and evolution of this highly diverse family of succulent plants, which has its centre of diversity in South Africa. She holds an MSc and a PhD in Botany from the University of Cape Town. 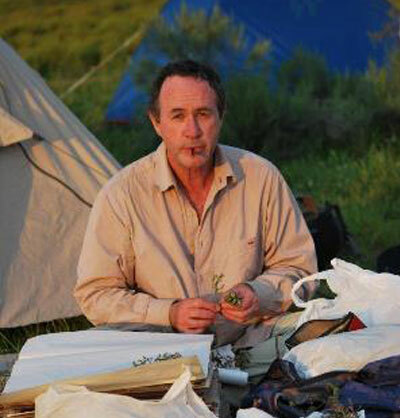 Terry Trinder-Smith has been employed in the Bolus Herbarium since 1990, and has been the Curator since 2000. 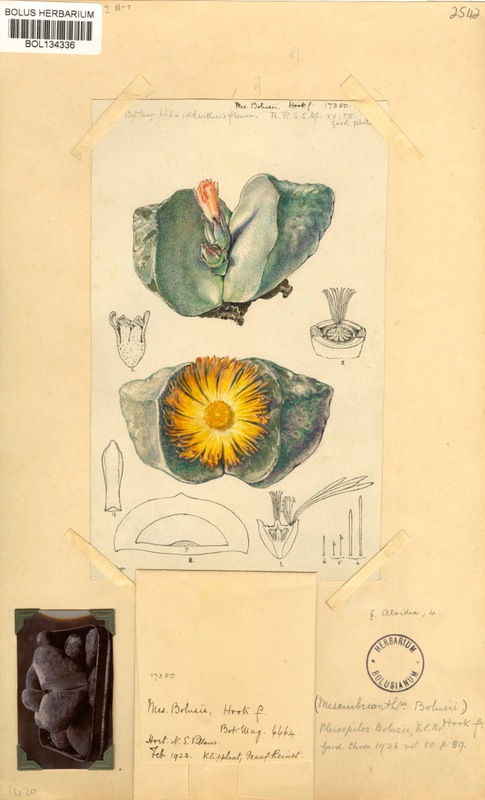 Recognising the value and irreplaceability of the illustrations of the succulent family, Aizoaceae, done by Ms Page and Ms Carter some 90 years ago, he seized the opportunity offered via the Humanitec project to initiate and oversee their digitisation. The Bolus Herbarium is the oldest functioning herbarium in Africa and, for the Humanitec project, we chose to digitise a collection of watercolour paintings and drawings by botanical artists Mary Page and Beatrice Carter who were employed at the Bolus Herbarium in the early 1900s. Both were trained artists who were employed especially to illustrate the Mesembs, a very diverse family of about 1800 species of succulents that are almost endemic to Southern Africa. The Bolus Herbarium has a very rich ‘type’ collection of Mesembs or Aizoaceae. Botanical drawings and herbarium specimens are very closely linked. Descriptions of a new species usually went with a drawing. But once they are pressed, many of the Mesembs’ characteristics disappear. The brilliance of their flower colour gets lost, drying to brown. The structure and dimensionality of the plant is also difficult to detect, because (the usually succulent and juicy) plant has been squashed. Orchids are similar in this way. Once pressed, you can’t see anything anymore. With some other groups, it’s easier to take a dried and flattened herbarium specimen and resuscitate it in water – they tend to fatten up again. But with Mesembs it is very difficult to work with specimens, so they are better represented by botanical drawings. The Bolus Herbarium and Library were started by Harry Bolus, a stockbroker, who made a lot of money on the stock market with diamond mines in Kimberley and grew to be one of the richest men in Cape Town. Interestingly, as a benefactor, he funded the studies of the Afrikaans poet, C Louis Leipoldt, who studied medicine at Guy’s Hospital in London and travelled in Europe, America and the East Indies. But Bolus’s grand passion was for plants and drawing – his special interest, orchids. When he first came out to South Africa he settled in Graaff-Reinet, but after 19 years there, he moved to Cape Town. The Herbarium, which was established in 1865, was initially housed at his home in Kenilworth, before it was relocated to Hiddingh Campus, and later to the HW Pearson Building on UCT’s Upper Campus. When Bolus died in 1911, he bequeathed both the Library and the Herbarium to the South African College (now UCT) – and made provision for a fund to establish a special research chair, the Harry Bolus Chair. The Library was especially valuable because there was no Internet at the time. Bolus recognised that you could only do botany with a library, so he had all these rare books brought to Africa. He sent people overseas to buy books, some of which date as far back as 300-years – and these now form part of the Bolus Library’s rare book collection. Because these specimens preserved so badly, she employed Page and Carter to illustrate the Mesembs she was studying. 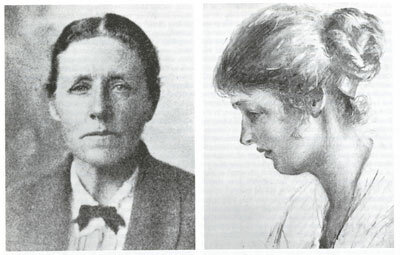 Her descriptions were accompanied by their drawings, and her Latin and Greek studies, helped her to describe over a thousand species (to the pique of her two chief competitors in England and Germany). Up until recently, all descriptions had to be in Latin. Both artists had illustrious careers as Bolus Herbarium artists and together produced more than 2 000 illustrations. Unlike commercial or decorative botanical drawings, where all the leaves and flowers are coloured in, these are proper taxonomical drawings – studies with a scientific purpose. Page and Carter only usually coloured in one leaf or flower, or even just a part of the flower, to show the colour of its petals. There are such subtle variations in colour that a large horticultural chart is needed to indicate what each colour is called. The leaf colour changes and is also important for taxonomic purposes. Some are very green in colour, some are grey, while some have a slight roughness to their surface. This texture could be seen under a microscope as well, but Page and Carter showed this by magnifying the leaf in their drawing to illustrate that it was slightly sculpted. The rest was drawn in pencil. Many are half-flower drawings, where the flower was cut in half to show its inside structure for taxonomic purposes. Flower characteristics played a huge role then as the Linnaeus system was mainly based on flower differences. The fruits were not always shown, as they only became important from the 1940s onwards. The whole taxonomic classification of plants is based on floral morphology. The drawings are currently stored as reference works together with the herbarium sheets with pressed specimens of the original plants from which the illustrations were produced – they were done hand in hand. They are highly regarded within the world of botanical illustrators and botanists. More than 3 300 original artworks have been scanned as part of the Humanitec project – each with its associated meta-data. We began by digitising the ‘type’ specimens, as there has been a global drive toward the digitisation of African botanical ‘types’, but now many other additional drawings have been digitised too. A ‘type’ is a specimen on which the description and name of a new plant species is based. These types are studied internationally and used to have to be mailed to researchers abroad. Having the images available digitally has cut down on the postal charges and administration required to send them. More importantly it protects the paintings, which are irreplaceable and were previously at risk of being stolen or damaged. Digitisation makes these rare botanical drawings far more accessible. Anyone who works in the field, regardless of where in the world they are based, can now view the paintings. On-screen access also makes it possible to zoom in up to a certain magnification, make measurements, and see details of the flower, fruit or leaves. These are huge advantages. These Pleiospilos bolusii illustrations and specimens were featured as part of the Standard Bank exhibition Exact Imagination: 300 Years of Botanically Inspired Art in South Africa, which showed at Standard Bank Gallery in Johannesburg from 8 October to 6 December 2014. View the Bolus Herbarium illustrations on the Digital Collections website.